This May, ceramic artist Carolyn Genders presents a new body of work in Sentience, an exhibition of over 40 works in clay at the Contemporary Ceramics Centre, London. Using traditional coiling and slab-building techniques, Carolyn creates bold, asymmetric sculptural vessels and forms in white earthenware with surfaces painted with abstracted imagery. She works by responding to both her material and to the rhythms of the form as she moves around inscribing marks, incising and scarifying through layers of matt vitreous slips and burnished terra sigillatta. Her finished pieces unite the physicality of working with clay with the potential of the created surfaces. 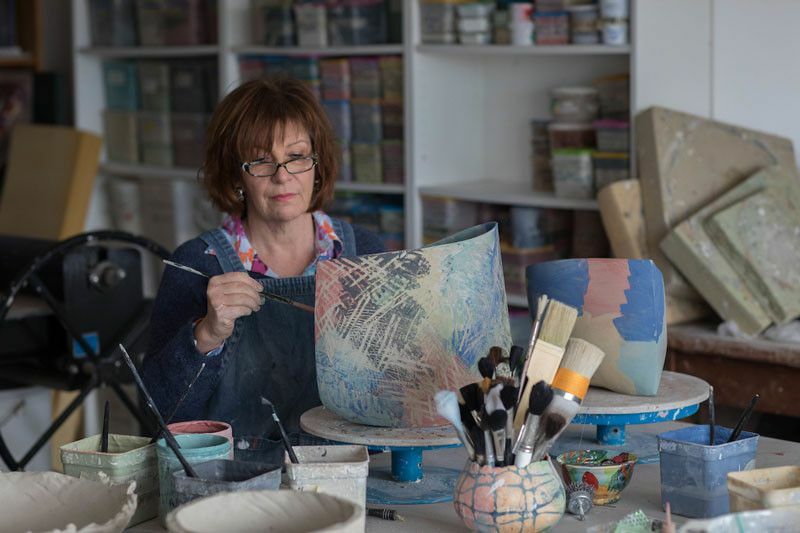 In creating the works for Sentience, Carolyn questions and investigates asymmetry, rhythm and balance, while celebrating the tactile and textural possibilities of clay. Works on show will range from large-scale sculptural vessels and forms, including a collection of monochrome pieces, alongside a series of wall-based works, The exhibition title refers to the action of feeling and Carolyn’s physical and intuitive response to her chosen material. Carolyn Genders is an established ceramic artist and printmaker. The essence of her practice is the relationship of form, line, brushstroke and colour, evident in both her works in clay and on paper. She exhibits internationally and her work is represented widely in private and public collections. 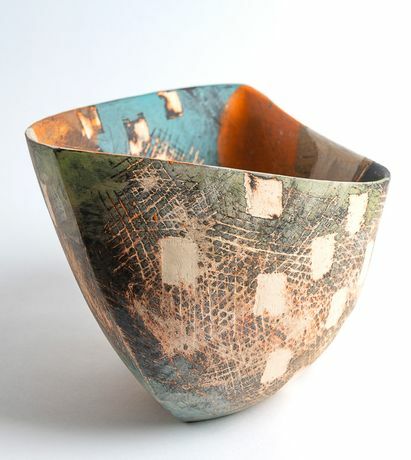 She is a Fellow of the Craft Potters Association and a member of Contemporary Applied Arts. Sentience is at the Contemporary Ceramics Centre from 2 to 25 May 2019 and is part of London Craft Week (8 to 12 May 2019).